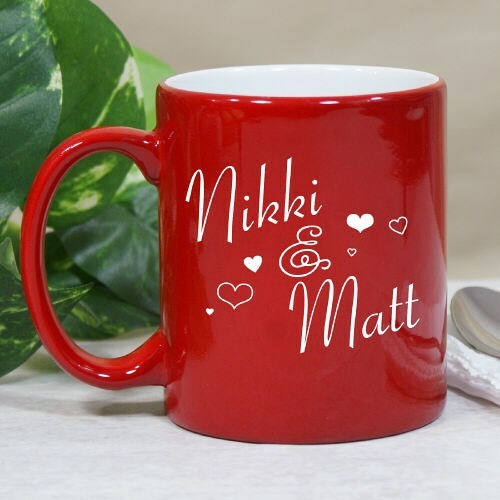 An Engraved Red Mug like this is perfect as a Valentine's Day gift or a gift for any romantic occasion. Your sweetheart will fall in love with you over and over again every time they use this Romantic Mug. Your new Personalized Couples Mug is available on our white ceramic coffee mug with a glossy red finish. Each Mug holds 11 fluid ounces and is dishwasher and microwave safe. Includes FREE Personalization. Personalize your Couples Coffee Mug with any name. Additional Details 800Bear.com has created a large collection of unique Valentine's Day Gifts to go along with your Teddy Bear's. We have put together some popular gift ideas so you can create a one of a kind gift to present your sweetheart. Any gift you choose from our selection makes a wonderful gift that anyone will enjoy. Make sure you add our Personalized I Love You T-Shirt & our I Love You Personalized Printed Frame to your gift ideas.